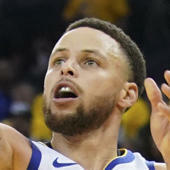 Curry totaled 28 points (10-23 FG, 5-15 3Pt, 3-3 FT), four rebounds, four steals and two assists across 36 minutes in the Warriors' win over the 76ers on Saturday. Curry had a productive night in Saturday's win, hitting five threes and turning it on late with 11 points in the fourth quarter. Curry has been an elite fantasy option all season, averaging four-year highs in points (28.4), rebounds (5.3), and three-point percentage (43.8).